About us | LABOX spol. s r.o. Labox Ltd was founded in October 1993 in Prague. Since the beginning of its existence the company has observed four basic principles. They are the high quality of our products and services, the continual innovation of our products and services with regard to the market requirements, reliability and first rate services for our customers. After the first three years of our existence we gathered and educated a team of employees who stand for the same principles as our firm does and are able to fulfill the requirements of our customers. 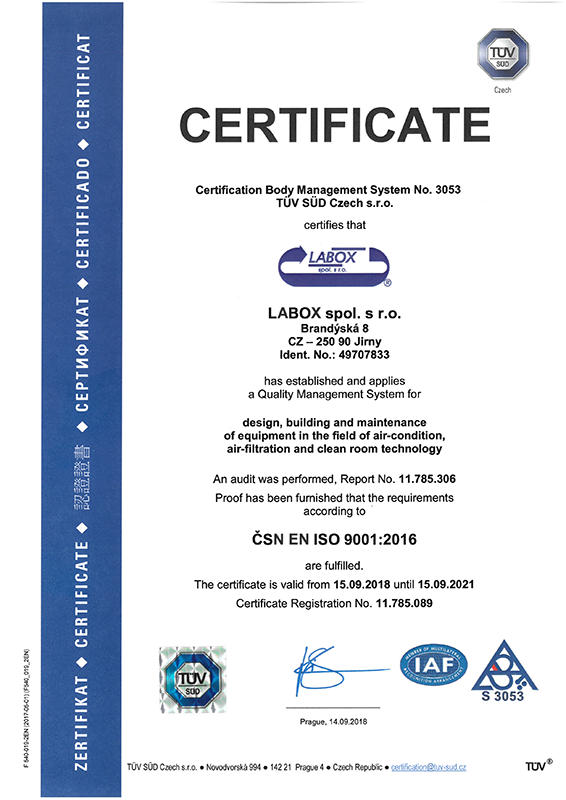 Since 2001 our company has had the ISO 9001:2016 certificate and our Accredited Testing Laboratory " is accredited by the Czech Accreditation Institute. The company is also certificated by National Security Authority of the Czech Republic, that allowing access to classified information up to the level confidential. Standard and customized products. Designed and manufactured to meet customers exact specifications. Turnkey delivery , i.e. full provision of all activities related to respective investment, i.e. from order specification through working out a study and implementation design, obtaining relevant permits, the implementation itself, commissioning of the device in pilot run after qualification possibly also qualification (DQ, IQ, OQ, PQ) of the clean room and technology installed. Technical and consultation services in the area of clean rooms and high efficiency air filtration. The qualification of clean rooms and laminar flow cabinets in accordance with FS, IES, DIN, EN, ISO (filter leakage test, airborne particle count, cleanliness level, airflow velocity, airflow uniformity, recovery test, pressure difference test, flow visualization test, containment leak test, temperature and humidity test etc.). Air parameter measurements (temperature, pressure, flow volume, flow velocity, pressure difference, duct air tightness). Efficiency measurements of high efficiency air filters and iodine filters are in place. Maintenance and service in field of clean rooms technology, laminar flow devices, HVAC, air condition, atc. Primary and secondary calibration of particle counters and aerosol photomoters.